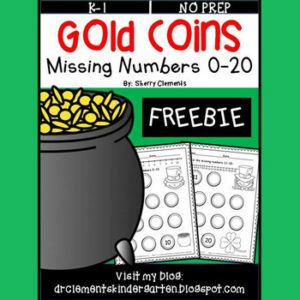 This two page freebie gives students the opportunity to practice writing numbers 0-10 on one page and 11-20 on the second page. The first and last numbers on each page are included to get the students started. Numbers are written on gold coin shapes to give motivation for the skill. A number line is included at the top of both pages to aid students in writing the numbers correctly and in order. These pages can be laminated or put in a page protector for a math center and have students fill in the correct numbers with a dry erase marker. Then wipe the sheets off, and they are ready for another student. They can also be used as a race to the end activity. Make two copies of the chosen sheet 0-10 or 11-20. Have two students see who can correctly fill in the numbers first without writing them backwards and making sure they are written neatly so they can be read. I hope your students have fun with this FREE number writing activity! Please leave me some love/feedback–Thanks! Thanks for leaving feedback on this resource!